Our team has many years experience of travel and exploration in the Sinai desert. A detailed knowledge of geography and geology, and a sympathetic understanding of Bedu culture and traditions, are key for a successful and memorable safari. Our goal is a sustainable tourism, with minimal impact and disturbance of the desert environment. In order to preserve the desert experience, we travel with a camel team, hiking or riding, and keep motorised transport to a minimum. 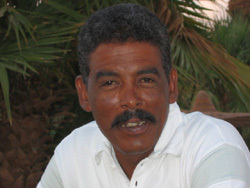 Mohamed Yassein el Aswany, born 1962 in Aswan Studied German and English in Cairo; since 1990 he lives and works in the Sinai as guide and desert specialist; responsible for trip planning and organisation. 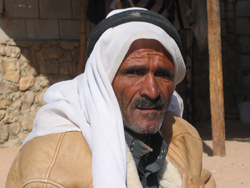 Gomaa Abu Suilm from the Mezeina tribe with many decades of desert travel under his belt, Gomaa knows the Sinai inside out. He can show us the most remote and beautiful corners of his country. Leader of our Bedu team. 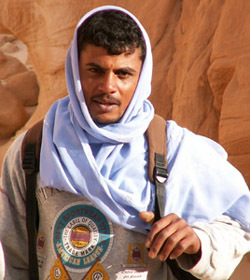 Sayed Musa from the Gebaliya tribe Long experience as a guide, in particular in the high-mountain region of St. Kathrin. Guests on our safaris also remember him as a cook of simple, but delicious desert meals.